Design your own stylish round floor cushion to grace your living room. Custom printed with your unique photos, they make a striking centrepiece and are super comfortable to relax on. The big round floor cushion comes in two sizes and features an elegant real leather handle for moving it around easily. Your customised round floor cushion is a fun home gift that can be used as extra seating or an additional piece of home decor. Filled with a 16cm deep, firm, comfortable foam cushion, it might just become your favourite spot to sit. Handmade and custom printed with your unique photos, they're perfect for children's rooms, play areas and relaxation spaces, and are totally bespoke. 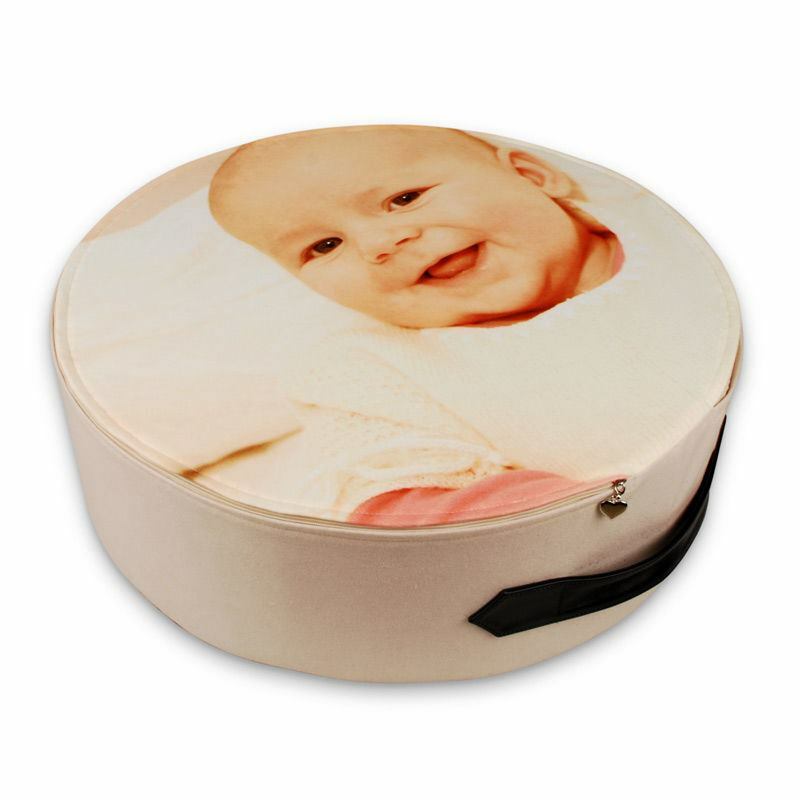 Your photos or designs are printed onto the top cover, and then you have a choice of 5 colours for the side of your big round floor cushion, which features an elegant leather handle in 2 colours. Choose a complementary one for streamlined style, or go for a contrasting colour and make a quirky style statement. The cover is detachable and is washing machine friendly. Really great photo print, super quality fabric and a robust design. All-in-all FABULOUS! Care: Detachable cover can be machine washed at 30°c. The internal foam cushion disc is fire rated for your safety. Design VIP round large floor cushions for your unique event space such as wedding venues, birthday parties or anniversary. Whether you have a specific logo or theme, or simply want to show off your best photos, this is a unique way to decorate an area but also provide practical seating. These are also super popular with children, due to the spongy nature and fun disc shape. To enhance their playtime experience, print a fun learning design onto the top, such as the alphabet with all the characters, a fun maths game or even a clock face to help them tell the time. They'll love the combination of education and play. Create a duo of big round floor cushions and present them in a stack in your lounge or conservatory. Printed with a design that matches your decor, it's a stylish effect that becomes a real centrepiece of the room. Bohemian designs, Moroccan inspired prints or cool retro geometric shapes, the choice is entirely yours. Like many of our products, your round floor cushion has a generous quantity discount. Save money per cushion when you buy two or more and enjoy a unique home furnishing nobody else in the world will have. Handmade by expert seamstresses, these really are a beautiful showcase of fine craftsmanship. We print your designs onto a soft, smooth, suede vision fabric that feels wonderful against the skin and is the perfect seat cushioning. A 16cm deep firm foam cushion pad expertly cut and inserted into the cover once hand sewn together, giving you a plump, comfortable round floor cushion to relax upon. The sides are made from the same material but printed with your choice of five colours; mustard yellow, vintage turquoise, ruby, lilac or beige. Finished with a chic heart zip pendant, your large round floor cushions are a gorgeous gift or home furnishing for yourself. Your designs are printed edge-to-edge across the entire top cover. We use a specialist printing process that fuses the ink deep into the fibres, creating a long-lasting, vibrant print. Colours and details are reproduced exceptionally well on our suede vision fabric, so whether you have designs with large areas with solid blocks of colour, or a photo montage with intricate details, the result is a striking print. The side of your round floor cushion comes in five colours, so choose the colour that will best complement your design or interior decor. As it's circular in shape, bear this in mind when choosing which photo to use, and ensure the photo goes over the bleed area so you're not left with any unprinted areas.